Yeah, but: You had me at "Heavy Duty Rubber-Coated Twist Tie". The Long Version: It's possible that the NiteIze GearTie is exactly what has been missing from your life. Godlike in its simplicity and angelic in its execution, the GearTie is a flexible wire that has been coated in grippy ridged plastic with knobby ends. And as if that wasn't enough, it's available in different colours, all of which are perfect. 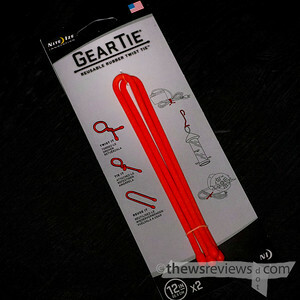 To be honest I really just bought the GearTie because it's immensely cool and out-of-gamut fluorescent orange. And then I bought another set because the "Lime" is an excellent green, and that's Penny's favourite colour. And am I ever happy that I did – because it turns out to be perfect for the task I had in mind for it. I need to stop the legs of my light stand from rattling when they're stowed. I use the stand to hold my audio recorder, and don't always have room on the sidewalk to set it up properly, and instead use it as the world's tallest monopod. Stopping incidental noise is critical. The GearTie is perfect for the job, and has no problem exerting enough pressure to keep everything in place. 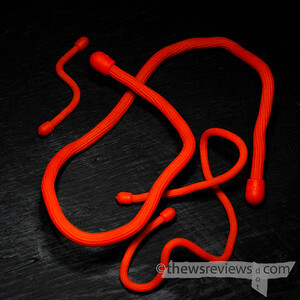 It's even easy to attach and remove, which is more than I can say for the elastic bungie-cord thing that I also tried, and its rubberized exterior means that it won't introduce rattles or noise of its own. Given that the GearTie works perfectly for such an oddball task, it shouldn't be a surprise that it's generally handy, too. It's strong enough to make into a hook to hang things from, can be folded into an impromptu tablet stand, or bent around to substitute for that inevitable missing lock on the only cleanish public toilet. It's even washable. And of course there are all kinds of different sizes available, each with its own tasks to be suitable for. Small ones become cable organizers, midsize ones are bent into hangers to dangle things from a shelf. There's just no reason not to have a few of them around.